Well I think I enjoyed this just as much as Divergent! I was hanging on to every word, I wanted to just grab any free moment to read what was going to happen next, each chapter a thrilling adventure in Tris' divergent world. There were so many surprises (Caleb and Peter)and I really loved the Four/Tobias and Beatrice/Tris relationship as it continued and Tris' awareness of her surroundings was very visual and she seemed to like the smell of "wet pavement". I have some favorite quotes- this one sums up Tris "Sometimes I feel like I am collecting the lessons each faction has to give me, and storing them in my mind like a guidebook for moving through the world. There is always something to learn, always something that is important to understand." And the definition of Insurgent; "A person who acts in opposition to the established authority, who is not necessarily regarded as belligerent." Finally, this book was all about choices and how those choices could define you, destroy you and free you. I found Tris and Tobias to be so brave in the face of such an uncertain world; but they were forging ahead for a good world. Soooo good, I highly recommend this book! 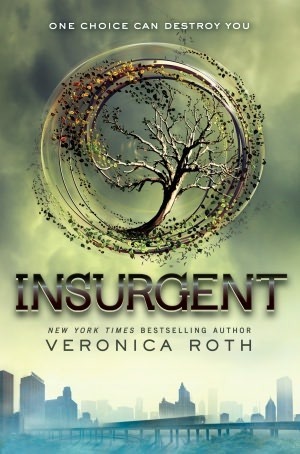 Sign into Goodreads to see if any of your friends have read Insurgent. I can't wait for this! Going to read it ASAP, hopefully this week!